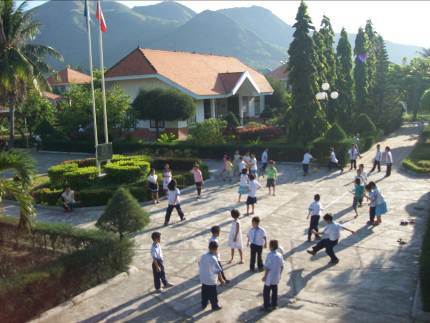 SOS Children's Village has been working in Vietnam since the late 1960s and in Nha Trang since 1999. Our organisation is very active in the area, supporting families, children and young people in the local communities. The coastal city of Nha Trang is situated in the Khanh Hoa province on the South Central Coast. It has an estimated 300,000 inhabitants at present but is expected to double by 2020. Traditionally the area has lived off agriculture and fishing, but in the recent past tourism has played an increasing role. Nha Trang's beach is among the most well-known and visited beach resorts in Vietnam. A commercial port is being constructed and this is expected to boost the economy of the area further. These developments mean that an increasing number of people are moving to the urban areas of the province. Although the area is relatively prosperous in the Vietnamese context, many people, especially those living off agriculture and fishing or those in precarious jobs in urban areas, continue to struggle to meet their basic needs. Ethnic minority families are particularly in need of support. The government has made funds available to develop the economy of households in mountainous areas of the province. For example families will be given seeds, animals and fertilisers and advised on farming techniques so that they can improve their standard of living. The growing tourism and industry sectors have attracted many people to come to live in Nha Trang. Although the families who migrate here dream of a better life, the majority end up living in informal settlements among the urban poor. Children who live in these circumstances face many hardships; many have lost parental care and many more are at risk of losing it unless they are provided with support. Most of the children who come into our care show signs of malnutrition and are in need of medical attention, especially regarding vaccinations. Human trafficking is a problem throughout Vietnam and the province of Khanh Hoa is no exception. Most of those trafficked, especially women and girls, end up being forced to work as prostitutes. The social and economic conditions in the area make the work of our organisation today as important as it was when we first started working here. The provision of family-based care, education, and support into adulthood has continued to improve the lives of people who lack even the most basic means to earn a living or ensure their children can receive an education. If children can no longer live with their families they can find a loving home with one of the SOS mothers and their brothers and sisters. There are 14 SOS families in Nha Trang who can care for up to 140 children. Every child has a "Child Development Plan" which is prepared in consultation with the child and the SOS mother. 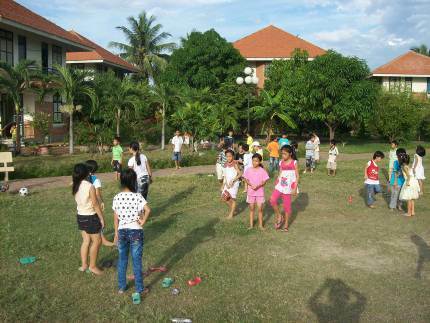 Young children from the SOS Children's Village and from local families can attend the SOS Kindergarten. Qualified staff at the kindergarten can look after up to 190 children. The provision of day-care is particularly valued by those parents who go to work because they know their children are being cared for by professionals. While they are in kindergarten, the young children get three meals a day, which ensures they are well-nourished. Older children can go to the SOS Hermann Gmeiner School which caters for over 1,000 children of both primary and secondary level. There is also a canteen where children can eat, thus ensuring they have at least one nutritious meal a day. Children whose families could not otherwise afford to send them to school are able to get a scholarship. The SOS Youth Programme gives professional support to young adults while they attend further education or start a vocational training course. The young people are encouraged to develop perspectives for their future, learn to shoulder responsibilities and increasingly make their own decisions.